Gigi Lai’s (黎姿) wish has come true! Eleven years after her younger brother, Stephen Lai’s (黎英) near-fatal car accident rendered him paralyzed he is finally able to stand up without using a cane. 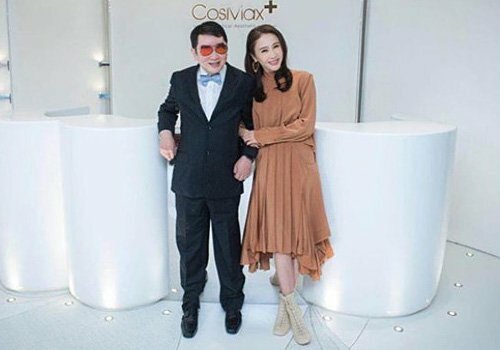 The siblings commemorated the moment with a photo posing in front of CosMax, their cosmetic business, and uploaded the photo onto Instagram. Indeed, she has been tackling hurdles in life since she debuted in the entertainment industry more than 20 years ago. At 14 years old, she entered showbiz to provide for her family, even paying for her brother’s medical school tuition, allowing him to graduate. However, she did not expect Stephen to end up in a car accident in 2007. He was unconscious for three months and almost became a vegetative person. Thankfully, Stephen was able to survive, but he was paralyzed. However, it hasn’t always been a smooth-sailing road for the CEO. In addition to succeeding Stephen’s business and caring for him, she also carries the duty of Mrs. Ma. In 2008, she married wealthy businessman Patrick Ma (馬廷強) and eventually gave birth to three daughters. Her time is divided between the company and her family. She’s a really good sis! @tiffany she is amazing. Her love for her brother is just amazing. Bless her. @nigel Gigi’s love towards her family is very inspiring. Good to hear that her brother is doing better, although it’s been an 11-year battle for him to stand on his feet again. Certainly, Stephen’s strength of will came from seeing his family fighting for him. I have a lot of admiration for Gigi Lai. She sacrificed so much for her family, and loves her brother so much. Good for her in all her success. She deserves it. I’ll always be rooting for her to do well. Really admire her. She could have led the easy life since she married a wealthy husband, and enjoy the tai tai life. But instead she continued working on her brother’s business when she didn’t have to. Yeah sure, it is easier with her husband help, but she could have easily chose not to work too. Thumbs up and massive respect. Such a heartwarming story. She’s a wonderful mother, sister and business woman. I also enjoyed her acting too. So admirable.